Hi everyone! Do you ever wish you could have a safer bleach alternative? Something without a chemical smell or hazard to your health or small children? I worked with a nurse a few years ago, who worked in surgery, and she told me they would educate women about the dangers of chlorine bleach & that it can cause breast cancer. When you search the web, (1), (3) you will find pros and cons to using Bleach, but it IS made of chemicals. If the scientists making it are using gowns, gloves, goggles and face masks, shouldn’t that indicate there is a respiratory hazard of breathing in the chemicals? Do you wear gowns, gloves, masks and eye goggles before doing laundry or cleaning your house with bleach? Bleach is corrosive and will eat at skin or anything it is placed on. It breaks down elastic in underclothing pretty quickly, if washed in it frequently. I once thought I would mix bleach with another “harmless” cleaning agent and I immediately got a foaming mist of horrible smelling “gas” coming up out of the bucket! I failed to read the label which states to never mix Clorox with any other chemical cleaning agent! So I quickly opened the windows and got the fans going to draw out the harmful gas. I have not used Clorox for a long time. Instead, I make my own with only 3 ingredients using a recipe by Jillian that I found online! (There are many different recipes for bleach alternatives online! Just search and find the one you like.) It really does whiten my clothes. For gray- dingy looking socks or under- clothing, allow them to soak for several hours before washing. My mom used this Natural Bleach Alternative recipe on an old dry rag to wash mold off my painted walls and baseboards. The mold came right off with some gentle rubbing! Mix. Add 2 cups per wash load or put in spray bottle and use as a household cleaner. NOTE: I cut this recipe in half and used an old half gallon empty vinegar jug to store the Natural Bleach Alternative in. Previous PostThe Skinny about Oils and FatsNext PostIt’s strawberry time! This one sounds neat. I will have to try it! Do you know if this has a “shelf life”? Reason I ask, is sometimes I can go quite awhile without using my bleach & didn’t know if the lemon juice would break down the hydrogen peroxide? I let my homemade bleach sit in the shelf for a while. I don’t notice any difference Maybe look at the comments on the original post and see Jillee has an answer! Here is the link I didn’t post in the other comment. 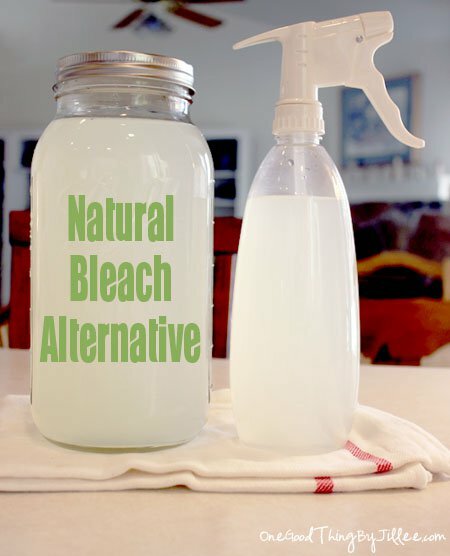 http://www.onegoodthingbyjillee.com/2012/10/a-natural-bleach-alternative.html.